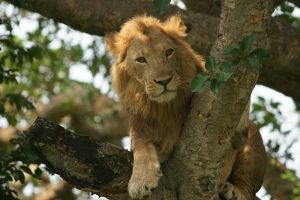 This 6 days Uganda safari tour is inclusive of a Uganda wildlife safari to Queen Elizabeth National Park Uganda; the second largest National Park in Uganda where you will encounter with several animals as they carry on their daily life in this natural habitat. Queen Elizabeth National Park is a notable safari destination famous for wildlife tours, chimpanzee trekking safaris, Uganda birding safaris and boat cruises. During you game drive in the park, in your 4×4 safari Landcruiser or 4×4 safari van, expect to see several animals and birds. Chimpanzees can be cited during trekking in Kalinzu forest. More animals and birds can be spotted during the boat cruise along the Kazinga channel; a river that joins Lake Edward and Lake Albert. You will be amazed with spectacular sceneries that are found with in the park like the crater lakes and the rolling savannah plains overlooking the snowcapped Rwenzori Mountains. Finally, our 6 days Uganda safari will take you to a magical wonderland; Lake Bunyonyi Uganda also known as a birding paradise. The name “Bunyonyi” means many birds therefore while here, you will have an unforgettable birding adventure experience as well as a boat cruise visiting the islands in the lake. This safari will start and end in Kampala. Day 1: Arrive in Uganda and transfer from the airport to your prior booked hotel. Day 2: Transfer from Kampala to Queen Elizabeth National Park with en route at the Equator and Mbarara for lunch. Day 1 of the 6 days Uganda birding safari Lake Bunyonyi & Mburo Queen Elizabeth Park wildlife tour Uganda: Arrive in Uganda and transfer from the airport to your prior booked hotel. Upon arrival in Uganda at the Entebbe International Airport, you will meet our professional safari guide waiting for you at the airport. He will take you through a short briefing about your safari in Uganda and then transfer you to the hotel reserved for you in Kampala/ Entebbe. Relax, have dinner and spend your overnight there. Day 2 of the 6 days Uganda birding safari Lake Bunyonyi & Mburo Queen Elizabeth Park wildlife tour Uganda: Transfer from Kampala to Queen Elizabeth National Park with en route at the Equator and Mbarara for lunch. You and your driver guide will depart Kampala in the morning after breakfast at your hotel and travel westwards through Uganda’s beautiful green countryside to the Queen Elizabeth National Park along the Kampala-Masaka-Mbarara highway driving for about 7hours. You will break your journey at the Equator for about 30 minutes. At the equator, you will have an opportunity to stand in two hemispheres at the same time. While here, you will take lots of photos, visit some craft shops where you can purchase some souvenirs for yourself or coffee shops for a cup of coffee. Continue your journey to Mbarara for lunch an them finally continue through the savannah grasslands with lots of banana plantations and several herds of local long horned Ankole cattle endemic to this part of the country. Upon arrival at the park, check in your accommodation that will preserved for you for dinner and overnight. Your driver guide will pick you up at the lodge as early as 6am/ 6:30am for a morning early morning game drive in Queen Elizabeth National Park in your 4×4 Land-cruiser/ 4×4 mini-van. While doing this awesome experiential game drive, you will spot a lot of wildlife in their natural habitat including African elephants, buffaloes, antelopes, impala, among others and a lot of birds. The game drive will last about 3-4 hours depending on your interests. You will later return to the lodge for breakfast, relax a bit and enjoy your hot lunch. In the afternoon, after lunch, go for a launch cruise along the Kazinga channel inside Queen Elizabeth Park where you will come up close with hippos, crocodiles, animals drinking water along the river and several aquatic birds along the channel. Return to your lodge for dinner and overnight. After your breakfast at the lodge, you will kick your day off your journey to Lake Bunyonyi driving for about 6 hours. Arrive and have lunch at the resort and after take a boat ride on Lake Bunyonyi, visit the neighboring islands and get the history of each Island, you will also get chance to view various birds like the grey crowned crane, red-chested sun birds, and many flycatchers. Retreat, dine and rest at your lodge. This lake is said to be one of the most beautiful places in western Uganda. It is the deepest lake in Africa with about 900 meters and also one of the few places in the country where it is considered safe to swim as it is bilharzia free. Early in the morning after your breakfast, you will drive from Lake Bunyonyi to Lake Mburo National Park Uganda for a game drive in the park. You will arrive in time for lunch, have lunch at your prior booked lodge, relax and do an afternoon boat cruise along Lake Mburo. The boat lasts for about 2 hours. You will see lots of water animals, birds, including Crocodiles, Pelicans, Hippos, Herons and the rare Shoebill stork if lucky. Do a simple game drive as you return to the lodge for your evening, relax, dine and spend your night there. Wake up very early in the morning, do a morning game drive in the park with your driver guide as you prepare to depart this part of the world driving back to Kampala, a journey that will take close to 4-5 hours. Lake Mburo National Park is gifted with a variety of attractions but the terrain is dominated by extensive wetlands, rolling grassy hills, seasonal and permanent swamps, wooden Savannah, and forests. It is because of these diverse ecosystems that render the park to be one of the richest in bio diversity. During your game drive in the park in your 4×4 safari van, 4×4 safari land cruiser, 4×4 safari minivan. Expect to see Zebras, Waterbucks, Buffaloes, Topis, Elands, Leopards, and a variety of bird species. Have lunch and travel back to Kampala to your hotel or Entebbe International Airport for your flight.